Hummus /Hummus bitahini, a popular middle eastern dish is served with khuboos or pita bread. This dish is popular around the globe and served as a dip or appetizer as part of an Arabic mezze. 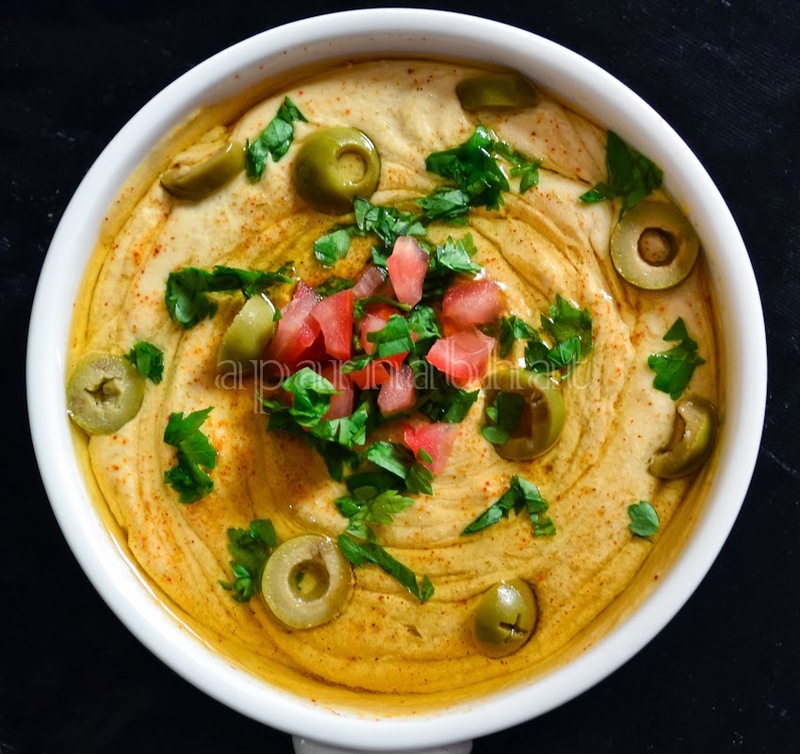 There are many different flavors that you can add to the basic hummus recipe such as avocado, roasted red pepper, roasted beet, squash, etc. Many recipes mention about mixing all the ingredients and blending it into smooth paste. I did it but somehow was not happy with the end result,,,it lacked the creamy texture as well as the taste. 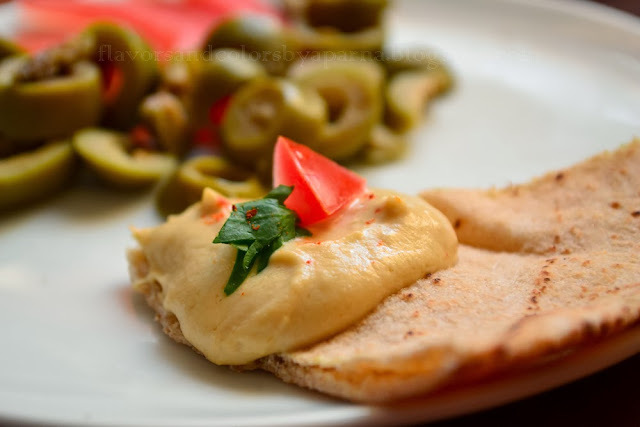 I googled to find more about ways to make a creamy hummus and the recipe at VegWeb was more convincing explaining the trick to make a creamy texture hummus. The clue was "Tahini" which adds flavor and texture to the hummus. The trick was emulsifying tahini with water based liquid or lemon juice before adding other ingredients. Mix tahini and lemon juice in a blender [step of emulsifying the tahini]. Blend it for about a minute or until tahini becomes fluffy and creamy. Add chopped garlic and puree until smooth. Open the can of chickpeas, drain and rinse them off in water. Peel the chickpeas and add them part by part in blender and continue to blend it to smooth puree. You can add little water if the mixture looks dry. Add olive oil and salt to taste. 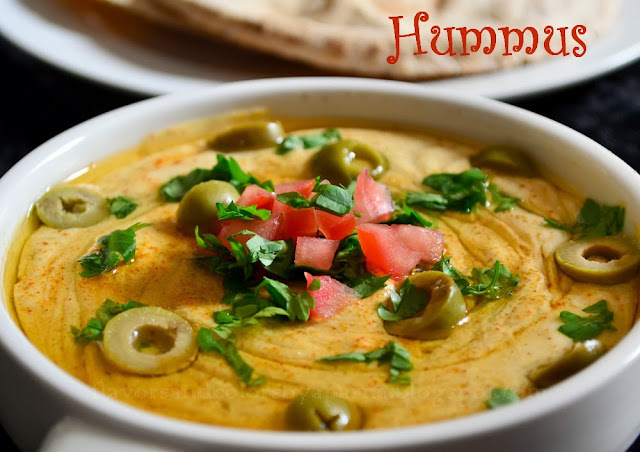 Blend it till you get the desired taste and texture for hummus. Spoon out the hummus on to the serving plate. Drizzle olive oil over it. Garnish with sliced olives, chopped tomatoes and parsley leaves. Sprinkle some cumin powder and red chilly powder/ paprika powder if you prefer spicier hummus. Serve it with pita bread, carrot cucumber sticks or chips. Optionally you can garnish it with toasted sesame seeds and whole chickpeas.